What ultimately made the difference at the Emirates today wasn’t the two goalkeepers, who both put on great displays, nor was it any individual player. 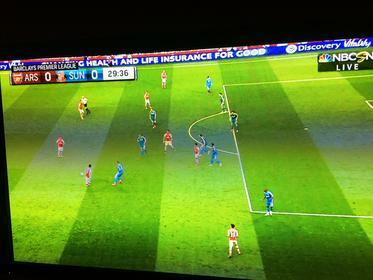 Rather, Arsene Wenger’s tactical decisions for this match ending up dictating the result from the first minute. Sunderland, A team who can’t play decent football any weekend (or weekday) home or away, went into this match knowing that a draw would keep them safe in the relegation battle. Thus, they were extremely organized, disciplined and compact, keeping defensive shape the whole match and consistently flowing the center of the park with defenders eager to slow down the Arsenal attack. This observation could have been made prior to the match, and while Sunderland did end up playing maybe a bit better defensively than advertised, their style of play was absolute predictable and should have been much better prepared for. Yet, Wenger’s tactics did nothing to exploit this. Instead of opening up the pitch by playing a natural winger in Theo Walcott, Wenger clogged the middle of the field putting Wilshere as a right winger, who ended up playing as a right sided central midfielder and Sanchez at left wing who ended up being a left sided attacking midfielder. Our wingers in this match were Gibbs and Bellerin, and while they both possess the crossing acumen and the pace necessary for that position, having Wilshere and Sanchez so far inside instantly made the game insanely narrow for Arsenal, playing right into Sunderland’s hand. (See picture below) This is the type of match in which you have to create space for yourself and teammates because of their compactness and discipline, however Arsenal could not have been more stagnant. The amount of times attacks fizzled out due to 3 or 4 offensive players just standing and watching their teammate rather than making a run to either receive the ball or create space for others was truly absurd for a team with as much quality as us. There was a consistent lack of movement that applied to everyone, the static nature of the players today bar Ramsey, who was his usual workhorse self, became more detrimental by the minute as the crowd continued to become more frustrated as well. Now, obviously there are many reasons why Wenger chose the shape and team he did, I myself have dreamt for quite a while of seeing Ozil, Sanchez, Wilshere, and Ramsey together due to their scintillating technical ability, but in reality they made it incredibly tight and cramped for one another. No once today until Theo came on did anyone take their player one on one and beat them. Instead our midfield constantly played short passes back into pressure, which in turn contributed to us being stuck outside their penalty area for huge portions of the match. Of course our overall passing was sublime, we kept possession well and we didn’t necessarily play bad, but we didn’t go at them or force them to stop us, we let them get set defensively. This is the type of match that champions win easily, not draw. Also, the stats are quite misleading, while we had over 20 shots in total, there were only one or two real chances which not surprisingly came directly from a player making a run in behind like Ozil in the 60th minute or Theo once he came on. The amount of times players were literally just standing on the ball waiting, it really is as the commentator said, a bit like groundhog dog, classic arsenal playing nice and well but not making a real impact on the match. In regards to individual performances for the Arsenal, Santi Cazorla was abysmal today by his standards. How one can absolutely dominate Man City and Liverpool midfield and then proceed to make 0 impact offensively against a Sunderland midfield of Larsson, Rodwell and Cattermole is beyond me. Cazorla was careless with the majority of his passes today and looked well of the pace; while I have no doubts over Cazorla’s quality, his attitude is another story as it is clear complacency is a concern for him and for a leader on our team and someone who has all the tools to unlock any defense, today was unacceptable. Similarly, Alexis Sanchez struggled mightily today forcing many passes and turning the ball over with regularity. Granted, the energizer bunny still works like a savage to win the ball back, but again, this is a superstar, a top 5 player in the premier league; and his overall play in the final third was severely lacking quality and composure. I couldn’t tell you one time where Sanchez took the ball down the line, on the contrary I could tell you about 10-15 different occasions when he cut inside and crossed/dinked the ball right onto a Sunderland defenders head. Both Cazorla and Sanchez were quite predicable today, something that hasn’t plagued them much if ever this season. Sadly, the worst player tonight was Giroud who was pretty lackluster the whole match, he never asserted himself and miss-controlled and miss-placed numerous ball as well as squandering some chances. On the other hand, Ospina was as solid as ever and brought a great sense of calmness and composure to the back line, something that was never really there with Szczesny. The match of the match for Arsenal though was never in question however, Hector Bellerin, take a bow son. Not only were some of his crosses put on an absolute platter for Giroud, but also his overall passing and defender were superb. Bellerin was sharp from the first minute to the last and was arguably our most dangerous player until Walcott entered the fray. This was a game that needed to be won because unlike Chelsea, Manchester City and the old United, we have struggled with these games in the past, we struggled with a similar game just last week even; and we needed to show our clinical nature not just against the top teams but against the lesser teams as well and with some consistency. Still, we are in pole position for third place and automatic qualification for the champions league and have a cup final to look forward too, thus today’s result shouldn’t call for anything close to panic, but it shouldn’t be taken that lightly either. We can and will be much better.